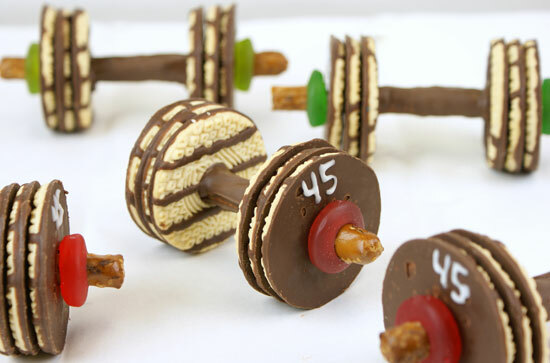 No need to be a weight lifter to take on these adorable cookie-weights! 1. Melt Chocolate CANDIQUIK® in Melt & Make™ Microwaveable Tray according to the package directions. 2. Break the ends of the pretzel rods off, so that each rod is approximately 5-6” long. 3. Spoon chocolate CANDIQUIK® over the center of each pretzel rod; leaving about the last 3/4” on each end uncoated. 4. Slide 3 cookies onto each end of the pretzel rods while the coating is still wet, set on wax paper to dry. 5. Stretch out the Gummy Saver candies in order to slide onto the ends of each pretzel rod. Optional: If you want to add numbers to your weights, melt Vanilla CANDIQUIK® and use a toothpick to draw on the “45”.